Like a feather in one’s cap, it feels great to see our lovely customers smiling in delight as they flaunt our designer garments. 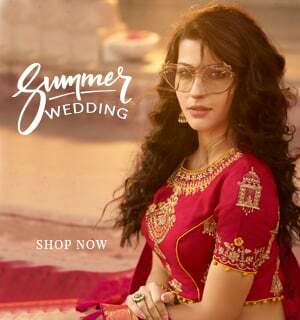 Catering to a global market, saree.com strives to deliver the best of ethnic wear and a hassle-free online shopping experience to each of its clients; bridging distances and bringing the latest trends in Indian fashion to the world. 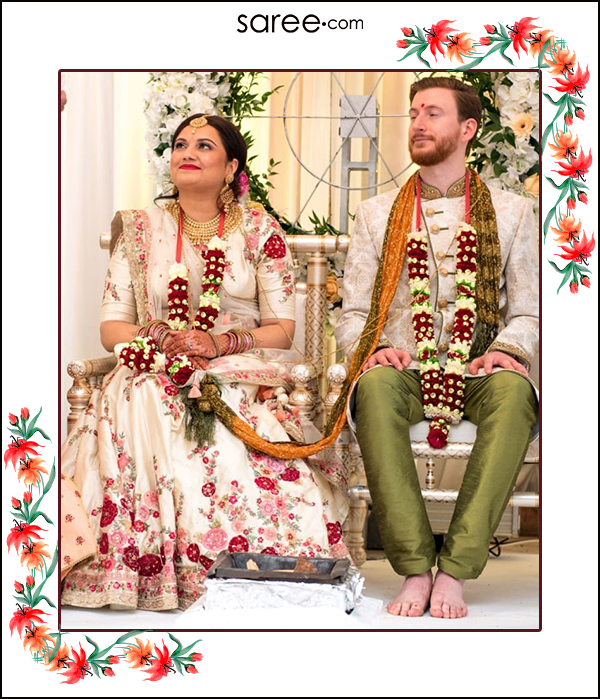 Based in the United Kingdom, Mital Vaiyata bought her wedding outfits through our dedicated video shopping service and shared her shopping experience with us. Internet is one of the most pervasive inventions today. Smartly connecting the globe, digital technology has drastically changed the shopping behaviour of people. Taking internet shopping one step ahead, saree.com offers video shopping services to its clients located anywhere in the world. This virtual store shopping facility allows the client to see the products over a facebook or skype call. A dedicated team consisting of stylists and customer care personnel suggests appropriate designs and also caters to every query about the product and its make. The cute and bubbly NRI girl Mital Vaiyata wanted bridal lehengas for her wedding ceremonies. 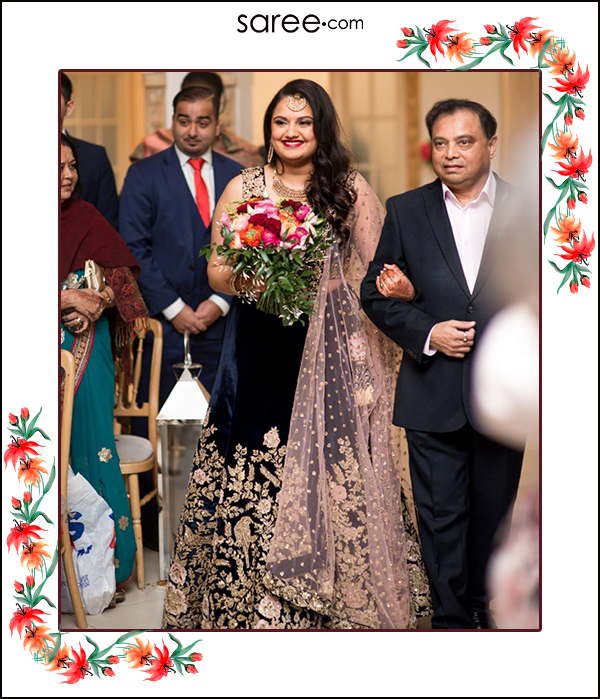 She chose a few garments from our online catalogue of exclusive designer lehengas and booked a video shopping appointment. The team of saree.com showed her the shortlisted garments over the call and sorted out her queries for each of them. Based in the United Kingdom, Mital had a virtual look of the collection which was kept in stock at our physical store in India and she promptly picked up two gorgeous designer outfits. 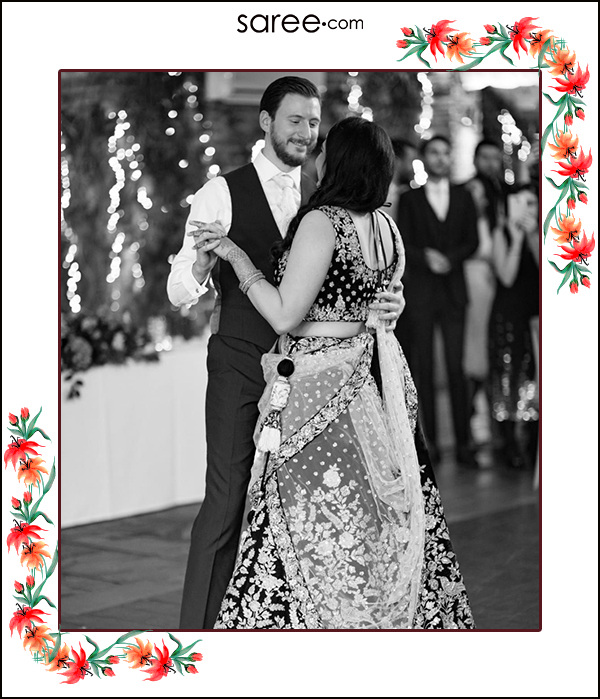 As a modern bride, Mital opted for a softer colour palette against the traditional red lehenga. For her wed-lock ceremony, she chose a cream- white floral lehenga which is also popularly known as the Shraddha Kapoor lehenga. 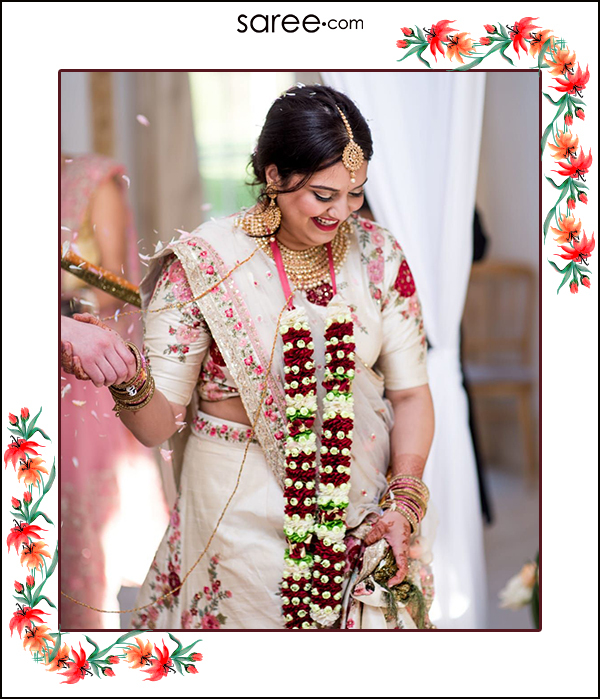 We love the way she accessorized this designer garment with just the right amount of jewellery to be a contemporary Indian bride! For her wedding reception, Mital preferred to have a darker palette. 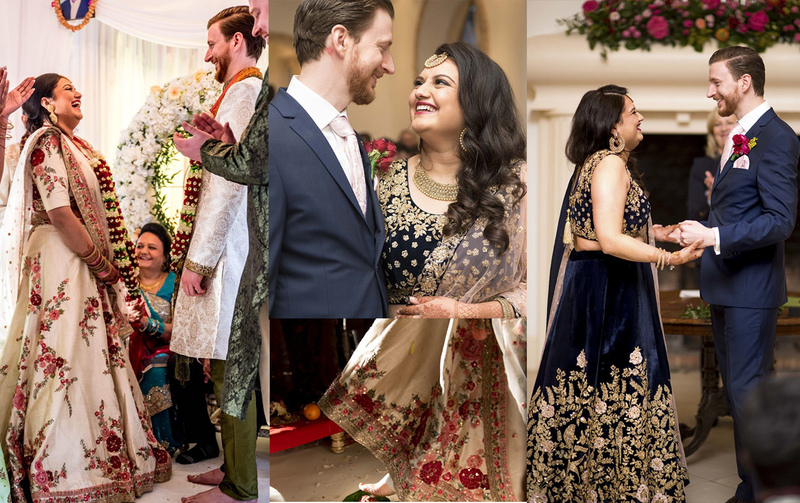 Coordinating her outfit with her hubby’s, she chose a dark blue velvet lehenga choli which was detailed with shimmery embellishments. Through the video call, she had a better idea about the embroidery details and the actual fall of the garment. She also wanted a customized blouse for this ensemble which was conveniently discussed over the call. Mital was guided by our stylist for taking her own measurements, which ensured precise dimensions for her outfits. While our stitched garments are available in standard sizes, we always offer a custom tailoring option and meticulously take care of any alteration requirements. It was indeed a happy moment, when this gorgeous saree.com bride, who was miles away, gave us a thumbs-up for the delivered garments. She was happy with the customized blouse design and the overall fittings. 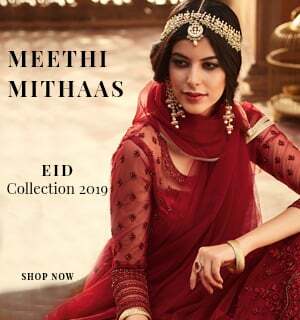 Mital’s delight story takes us closer to our ultimate goal of seeing happy faces of every person who dons a saree.com outfit! 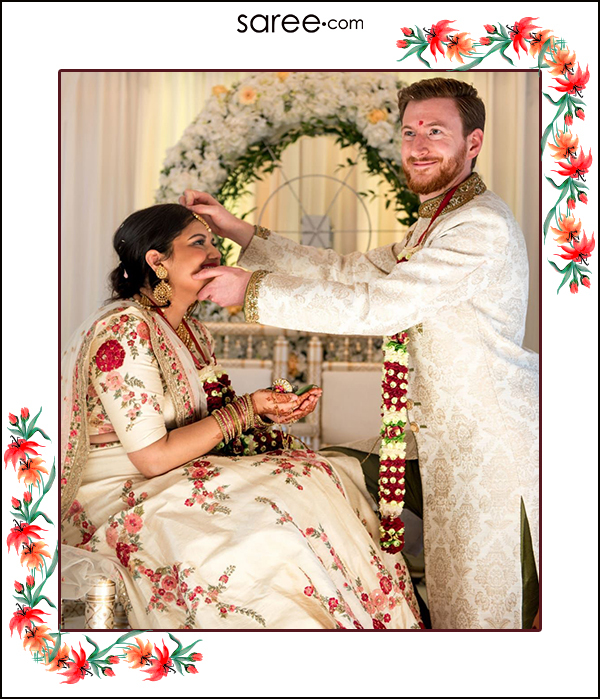 We wish the couple a lovely life of togetherness and happiness ahead. Which Are The Best Colours For Your Complexion?